Uppsala, Sweden—January 21, 2013—Today, IAR Systems® launches a new version of its high-performance development tools for Atmel AVR 8-bit microcontrollers. 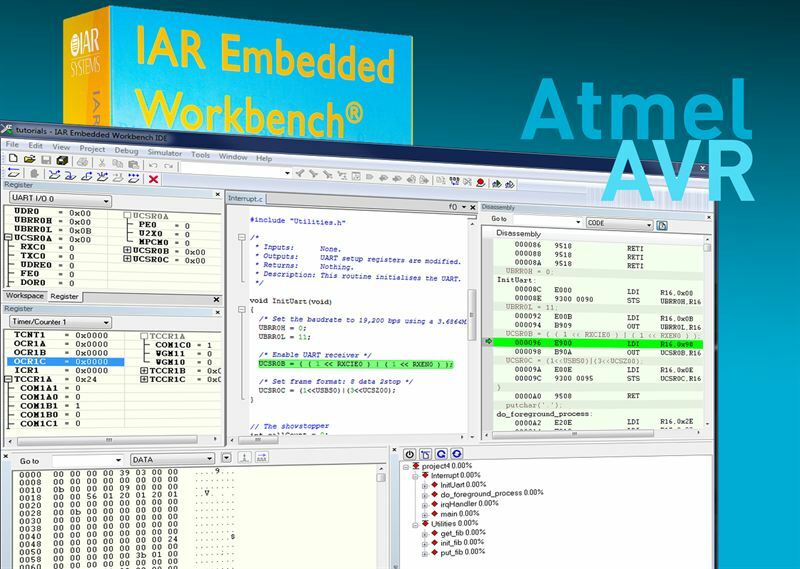 IAR Embedded Workbench® for AVR, version 6.20, adds a new user-friendly text editor and source browser, new debugger functionality, and support for additional devices. The text editor introduced in this version facilitates coding through time-saving functionality such as code completion, parameter hints, code folding, block select and indent, bracket matching, zooming and word/paragraph navigation. The new and improved source browser simplifies project navigation by introducing functionality that, for example, lets users go directly to a selected declaration, or find all references to a selected symbol. New in the comprehensive C-SPY® Debugger is support for the possibility to attach to a running target. This functionality simplifies and speeds up debugging by letting users attach the debugger to a running target board without resetting it. This version of IAR Embedded Workbench for AVR uses IAR Systems’ new license management system (LMS), which introduces features like commuter licenses, automatic license activation, and support for virtual servers. The new LMS makes it easier to administrate and manage licenses and a single installer concept enables easy transfer between different variants of IAR Embedded Workbench. The new version also includes support for additional AVR devices from several of the 8-bit AVR product families. IAR Embedded Workbench for AVR is a complete set of high-performance C/C++ development tools with extensive support for devices in all AVR families. The powerful tool suite features world-leading code optimizations and is also available with extensive support for Atmel’s 32-bit AVR and ARM devices.